The future is here. Why deal with all the inconveniences of gas lawn mowers when you don’t have to anymore? Go green, go cordless! The power of these machines has greatly improved over the past years and they put their gas guzzling, stone-age brothers to shame! Lots of power and a big mowing deck make this one of the best battery powered lawn mowers around. It just ticks all the boxes. It is not cheap, however this machine is worth every penny in our opinion. Just read the glowing reviews! The best battery powered lawn mower for the money comes from Greenworks as well. This machine has less battery capacity, and the deck is smaller to match, so that you won’t use much power compared to the top-level machines. It still is a great performer though, this machine is great value for the money. 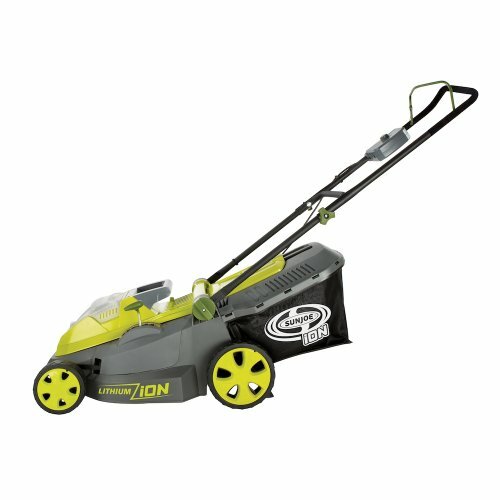 Only have a small yard to mow, but still want to enjoy the convenience of battery power without spending a fortune? 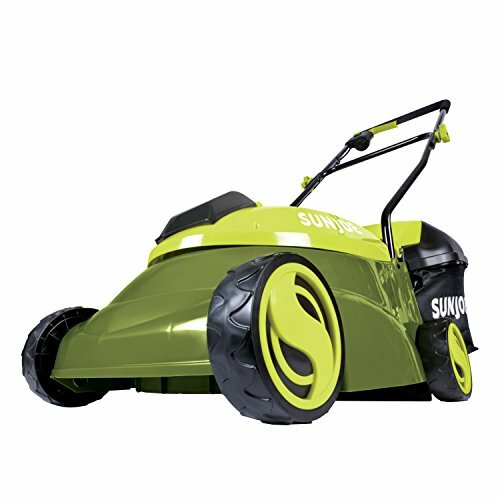 Check out this mower from Sun Joe. In our opinion this is your best bet if you only have a small yard to mow. It really is amazing, the great machines that can be produced for so little money nowadays. Are Battery-Powered Self-Propelled Mowers Feasible? 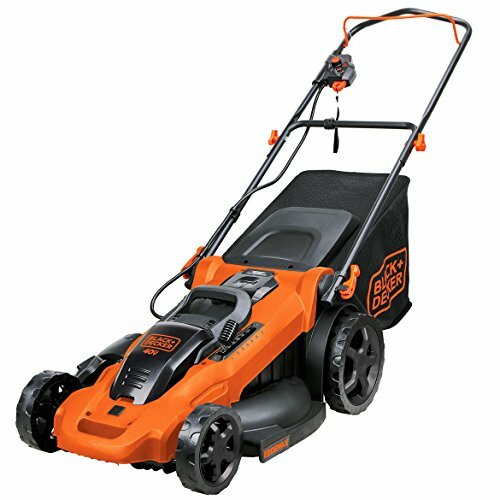 Do I Need a Mulching Battery Lawn Mower? How to winterize a battery powered lawn mower? Like everything nowadays, there is such a wide array of brands and products to choose from that it’s easy to get lost, whether you are shopping off or online. That’s why we have taken the time to hand pick the best and put them together in this buying guide. We have come up with 3 categories and chose the best battery mower for each category. The categories range from high-end to low-budget. Our pick for best mower of each category can be found in the table up top. Further down the page you will find a comprehensive review of all 9 reviewed mowers. Also don’t forget to read our buying guide on this page. It describes the most important buying considerations, and explains all your questions regarding batteries! There is no need to rush into a purchase so take the time to choose the perfect lawnmower for you. You’ll be able to get a great mower that will help you handle your lawn care needs in the years to come. You won’t have to deal with the noisy gas-powered models anymore and will have a great experience every time. If you’re a homeowner, then you likely know how busy you can get in the summer with yard work. Tending to your property’s needs is essential when you want to make sure that it looks its best at all times. 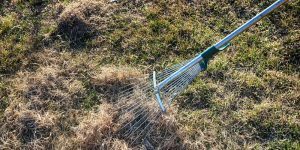 You’ll want to keep up on your gardens and, most importantly, will need to keep your lawn mowed. Mowing the lawn may either be something you look forward to doing or find to be a chore, depending on your perspective. Whatever you think about the mowing process aside, you know how good it feels to see your lawn when it’s freshly cut. 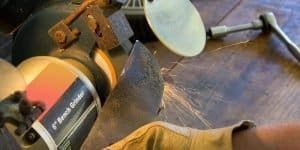 In order to ensure that you get a nice clean cut every time, it might be a good idea to look into purchasing a new lawnmower. When you have the best tools for the job available to you, it’s that much easier to get things done right. 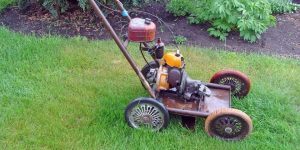 There are many people who have started turning to battery-powered lawnmowers for their convenience and advantages over gas-powered models. Before you decide to buy a new battery-powered motor, it’s important that you consider many different things. You’ll want to be sure that this type of lawnmower is right for you. Making sure that the different features available on the mower match your needs is crucial if you want to have the best experience possible. 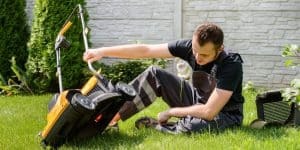 For this reason, you should make use of this buying guide to learn more about the pros and cons of battery-powered lawnmowers. 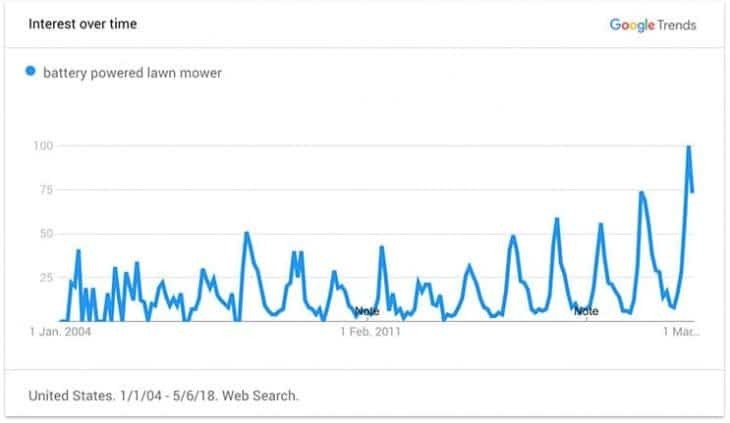 In the below Google Trends graph, you can see how interest in battery powered lawn mowers has almost doubles in 2018 compared to the years before. This clearly indicates there has been a turning point in favor of battery technology. Battery power has finally become powerful and reliable enough, while keeping cost very affordable for most people. There are many great benefits that you’ll be able to enjoy if you decide to purchase a battery-powered lawnmower. 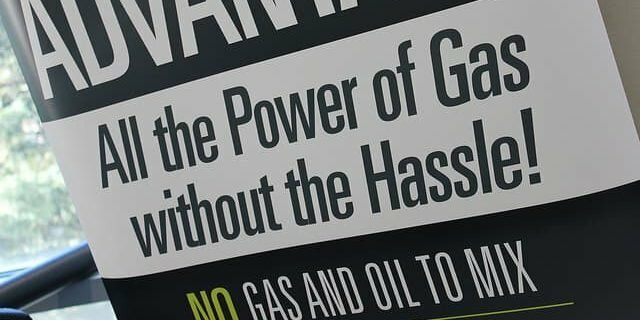 They operate in much the same way as gas-powered models that you may be more familiar with but they have several important differences. One of the most immediately identifiable differences that can be seen as a benefit is the lack of exhaust. Battery-powered lawnmowers run cleanly and don’t stink up your yard with any sort of exhaust fumes. These types of lawn mowers run considerably more quietly than the older gas-powered models. You won’t have to feel guilty about waking up the neighborhood early on Sunday morning when you make use of a battery-powered lawnmower. It runs quietly and creates far much less of a disturbance because of it. It isn’t completely silent but the whirring of the engine is substantially less audible than the monstrous sounds coming out of a gas-powered mower of similar size. A good battery-powered mower uses a lot less energy to cut your grass. This can make mowing your lawn a bit safer in the process. Using older types of mowers can cause rocks to be kicked up and thrown across your yard at a high velocity. These battery-powered mowers don’t do that, ensuring that you won’t be damaging your property or accidentally launching any sort of sticks and stones in your path. You won’t have to concern yourself with these mowers getting hot, either. 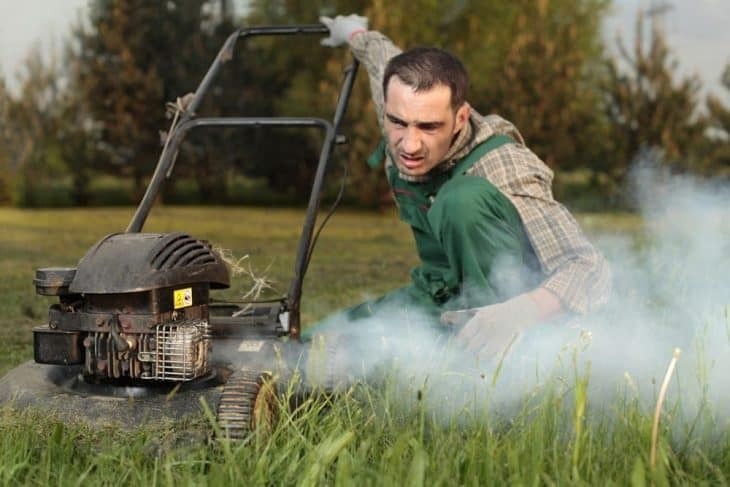 After using a gas-powered lawnmower for a long time, they can run very hot and you need to be careful about where you’re touching them. This isn’t a concern with a battery-powered motor. It runs more efficiently and doesn’t generate the amount of heat that a combustion engine would. Finally, you don’t have to worry about storing fuel any longer if you decide to buy a battery-powered mower. The need to go out and purchase gasoline every time you want to mow your lawn is a little cumbersome, to say the least. Needing to store fuel in your garage or storage shed can be a bit of a nuisance as well. It’s a lot more convenient to simply be able to charge your battery-powered motor when it needs it. “With a typical push-type cordless lawn mower, a third of an acre can be mowed on a single charge. A cordless lawn mower requires 3.5 kW to recharge. With the electricity rate at USD 0.11 per kW-hour, it will therefore cost USD 0.38 per recharge and USD 1.04 for mowing an acre. When you’re thinking of purchasing a battery-powered lawnmower, you need to understand the particulars about the battery itself. Learning about what AH, or amp-hours, are and how they relate to voltage is essential. This may sound as if it would be an intimidating topic at first but once you get into the specifics, you will see that it’s simple to understand. Ah simply refers to the capacity of the battery itself. The amount of amp-hours a battery has determines how much energy is stored inside. If you see a battery that says it has 100 AH, it will be able to operate for 20 hours while outputting five amps worth of voltage. In order to understand how much battery life you will get, you just need to do some simple math. Generally speaking, the amp-hours and expected battery life are going to be represented on the package with any mower you buy. You won’t literally have to do the math to know how many hours the battery is expected to work on a full charge. This is just giving you the information about what the amp-hour designation means for your battery. You should also understand that the amount of time the battery will stay charged is a generalization. If it says that you will get a certain amount of hours worth of use out of the battery, it could actually be slightly lower or higher than that mark. This is due to variables that cannot be factored into your equation every time. Things such as how hard the battery is working, temperature, and other aspects are your variables. It’s not really worth digging into the semantics too deeply. Just understand that the amp-hours are a representation of how long your battery last between charges in a general sense. For most people, the time you have to go between charges is very generous. You’ll find that it is overall a very convenient option and you’ll be able to use it for longer than gas-powered models. There are a few different types of batteries that are used inside of lawnmowers. The most commonly used batteries in lawnmowers are 12V batteries. These have been used to great effect for many years and are the most likely battery to find in whatever you decide to purchase. 12V batteries are rechargeable and very reliable. Not all batteries are the same size. Some mowers have very particular batteries and may be of a different voltage. The type of battery that will be in your battery-powered lawnmower could differ from the 12V norm. Understand that you’ll need to buy whatever battery is recommended for your particular lawnmower if you ever need to replace the original. It’s inadvisable to use a battery that you won’t know will work inside of a lawnmower. This could cause some damage to the mower itself and could cause issues with voiding your warranty, depending on which manufacturer you buy from. Stick with whatever is recommended for the model you bought. You shouldn’t need to change your battery with regular frequency so it isn’t something that you should be overly concerned with. Another type of battery that is being used in electric mowers currently is lithium-ion batteries. The downside to this is that the batteries aren’t rechargeable. You will buy one of these lithium batteries and it will last for a very long time. Eventually, you will need to buy a replacement battery just as you have to do for your car. It’s easy to think of the lithium batteries as being more similar to your car batteries. They will work very reliably for you but eventually will need to be switched out after a period of time. You should only need to use one battery at a time in your mower. If you buy a model that makes use of lithium batteries, then you’re going to need to replace them over time. How many batteries you will need to buy during the life cycle of your lawnmower isn’t something that can be determined. You could use the same mower for many years and have to replace the battery several times during that period. The 12V batteries won’t need to be replaced as often. It’s possible for anything to suffer some sort of failure after years of use but these batteries are designed to be rechargeable. This makes them perfect for people who don’t want to have to mess with switching the battery from time to time. Which battery type will appeal to you the most depends on your specific needs. There are two basic types of motors to choose from with these mowers: brushed and brushless. You probably won’t know the difference between the two unless you happen to have owned one of these mowers in the past. Essentially, the brushed mowers are ones that run a little less efficiently but have several advantages of their own. When you buy a brushed mower, you will be getting a reliable engine with simple wiring. It’s easy for it to be wired to DC power, making it possible to turn the engine on easy using something such as a switch. These models are typically a bit more inexpensive than their brushless counterparts. The trade-off is a little less efficiency in how the motor operates and the motor operating slightly more noisily than the brushless models. Brushless models are highly efficient. They can be as much as five to ten percent more efficient than brushed mowers. The cost to get this type of mower is initially a bit higher and you’ll find that it takes extra steps to start this sort of engine due to trickier wiring. Your engine will have a long lifespan, though, and you won’t have to be concerned about wearing out brushes over time. Which one of these engines will appeal the most to you is something you have to decide. Many people go with the brushed motors simply because the cost is more affordable. You can still buy a brushless mower without breaking the bank but it just isn’t going to be quite as inexpensive. The brushless models will have greater longevity so you should take that convenience into account before making your decision as well. When you want the best of the best when it comes to mowing your lawn, you go looking for a high-end battery powered lawn mower. 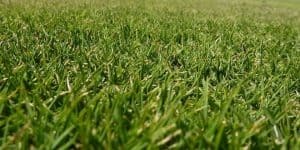 While they may be the most costly, they’re also great for getting your lawn taken care of in an efficient and environmentally friendly way. With a battery-powered mower, you won’t have to worry about any noxious fumes in the air or having to add gasoline or oil periodically. All you need to do is make sure you have a fully charged battery and you’ll be good to go. With a battery, you also won’t have to deal with an annoying cord that can get tangled or run over when you’re trying to get the job done. Particularly with the high-powered lawn mower options, you’ll have the possibility of being able to run your mower for up to an hour on just one charge. Many of the chargers that come with these mowers are also made for rapid charging. Many only take about 30 minutes to get a full charge. That means you’ll have time for a quick break during the big jobs. If you’d rather not take breaks, then you always have the option of having two batteries so that all you need to do is switch them out before you get going again. High-end lawn mower models often provide a lot of choices, as far as what you choose to do with the clippings. In most cases, you can have the clippings exit out the side of the mower so that they aren’t blowing into your face, you can bag them if you prefer a clean looking lawn, or you can mulch them to help keep your soil filled with nutrients by effectively recycling the cut grass. Below, we’re going to take a look at some popular high-end battery-powered lawn mowers. The Greenworks mower comes with a 21-inch deck made from steel and is designed to be able to provide the option to mulch, bag or use a side discharge for getting rid of the clippings. It comes with a 4.0Ah battery and a charger that is made to provide the battery with a full charge in 60 minutes. The battery itself is capable of lasting for up to an hour before needing to be charged again. The motor in this mower is a DigiPro digitally controlled brushless motor which allows it to function more efficiently and give you a higher level of performance. With the SmartCut technology in this machine, the mower will be able to detect the amount of grass around and be able to adjust itself accordingly. 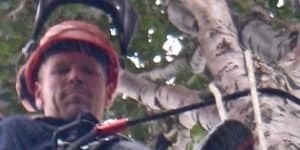 This can help keep the battery running for longer periods of time as well as keep you from having to adjust the cutting heights for every little change in your lawn. It’s designed to be lightweight, which makes it much easier to move and store without causing you to strain yourself. It’s also able to handle heavy duty tasks with little problem. It also allows you to adjust the height of the deck with a single lever when needed. 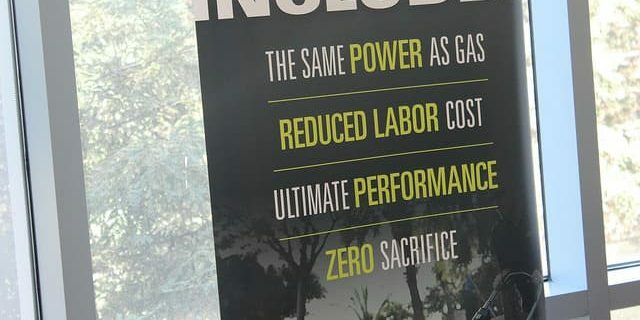 This mower doesn’t make you sacrifice power for the environmentally friendly aspects. You get both in one awesome package, and deserves our label as the best battery powered lawn mower money can buy. This mower has a push button start, making it easy to get going without having to pull on a cord over and over. It also has one lever that allows you to choose from 7 different positions to achieve the optimal height of cut. It has a 21-inch deck made from steel and allows you to choose between bagging, mulching or side discharge for your clippings. With the 82v lithium-ion 2.0Ah battery, you’ll be able to get up to 45 minutes of runtime. This particular kit comes with two of those batteries, which means you won’t have to wait between charges. The Snapper mower is capable of sensing the amount of grass around it and adjusting the motor power in order to better suit your yard. For example, if the mower is on but sitting on pavement or another non-grassy area then it will automatically shift to a lower rpm so as not to waste battery time while not working. On the other hand, if it is being used in an area of overgrowth, it will power up to match the need. This allows it to make sure it’s meeting those needs without wasting energy when it isn’t required. It also comes with a 1.6-bushel bag for when you want to have a clean looking yard. You simply attach the bag and make sure to empty it out when needed. The battery on this mower is capable of being charged in about 30 minutes, so you won’t have to wait long if you’re in the middle of mowing while it needs to be recharged. Once it has a full charge, it will be able to last about 45 minutes. 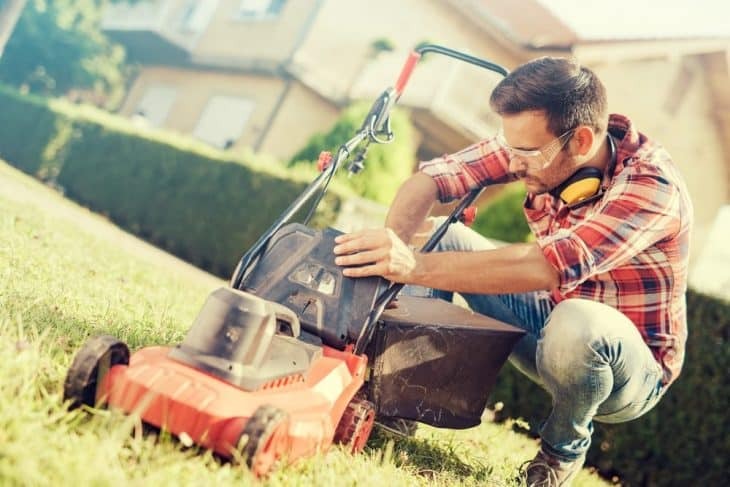 If you have a larger lawn and feel it may take longer than that, it may be a good idea to get a second battery to make sure the job gets done without any pauses. This quick charging time is due to the combination of the 4.0Ah advanced Arc-Lithium 56v battery and the rapid charger that comes with the mower. The handle on this mower folds in easily, making it a synch to store even if there isn’t a lot of space. You’ll be able to easily store it upright against a wall with no problem. It also has a 20-inch cutting capacity for when there is more overgrowth and is made to be weather-resistant. 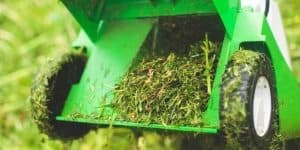 Like other battery powered motors, you’ll be able to decide what you want to do with the clippings, whether that means bagging them, mulching them, or using a side chute to get rid of them. It also has LED headlights that will be able to help you see no matter what the weather conditions are when you’re mowing. This model also generates 30% less noise when compared to a gas-powered mower. In some cases, you may be looking for a mower that can provide the best of both worlds. If you’re not looking to spend the money on a high-end lawn mower, but still want something that is going to be able to get the job done, then the mowers that follow in this article might be the right fit for you. A lot of these mowers are great for smaller to medium-sized yards, as they do tend to run a little smaller. In many cases, their outer portions are also built from plastic. This can sometimes give them the appearance of toys but make no mistake, these are still powerful tools and should be handled as such. 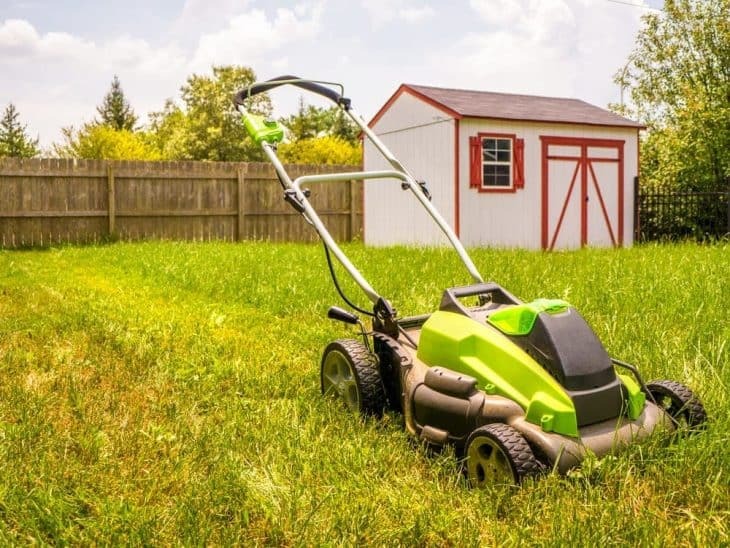 Some mid-level mowers may not provide as many options or have the same amount of power as the high-end models, so it’s important to take into consideration the size of your lawn and what amount of power it’s going to take to keep it looking nice. If you’re someone who is great with mowing regularly and not letting the grass get too high in between, then these mowers can provide an excellent option for you. It’s all about what you need and what your budget is for this kind of an expense. This mower will provide you with the ability to either bag or mulch your clippings as you choose. 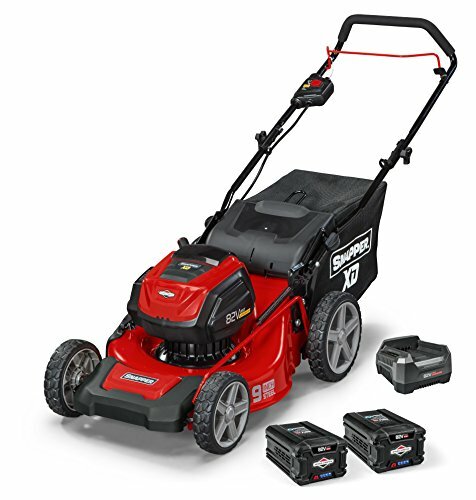 It has a 16-inch cutting deck that is perfect for small or medium sized lawns. You’ll be able to maneuver with this lightweight machine very easily. 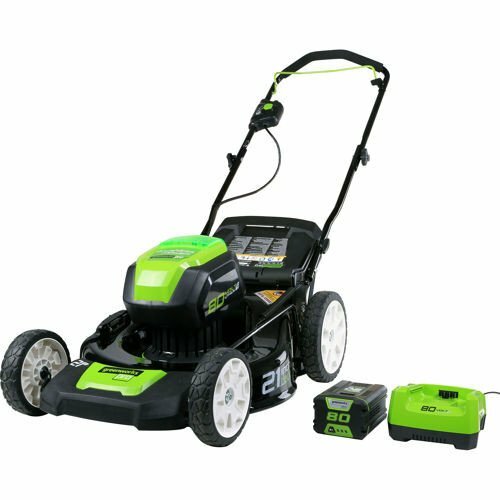 This mower comes with a G-Max 40v 4Ah Lithium-ion battery that works and is able to power multiple Greenworks tools, making it really convenient when you don’t want to have to search for a specific battery for a specific tool. You’ll also get a charger for your battery, which means you won’t have to worry about purchasing one separately. With a single lever, you’ll be able to adjust the mower deck into five different height positions to get the optimal height of cut as you work. With these adjustments you’ll be able to cut grass from 1 ¼ inches high to 3 3/8 inches high. This mower is also made with 6-inch front wheels and 7-inch rear wheels in order to make maneuvering easy. It also runs quietly, which means you won’t have to worry about waking up the neighbors if you prefer to get your mowing out of the way early in the day before the heat sets in. You also won’t have to worry about too much vibration, which can get annoying and uncomfortable. All these benefits made us crown this model from Greenworks to be the best battery powered lawn mower for the money. 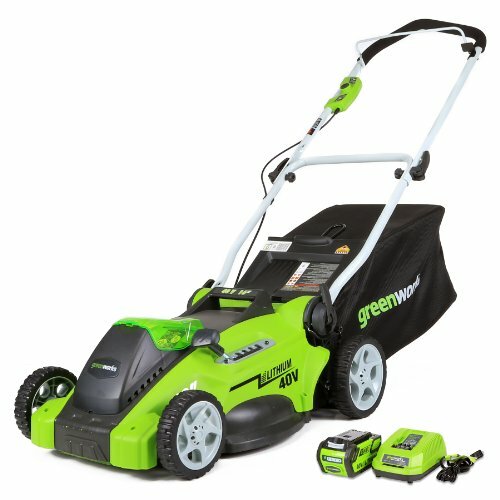 You will not go wrong with this mower from Greenworks. The Sun Joe lawn mower is built with a powerful brushless motor that is able to help increase the efficiency of the battery as well as helping you to get the most out of the motor performance. It’s also quieter and has less vibration than gas-powered models and extends the overall life of the motor. Because it’s a battery-powered mower, there’s no worry about oil, gasoline, or a need to plug it in. Cords can easily get tangled, or even run over, but with this mower you won’t need to worry about that. This machine is smaller than many other mowers, making it perfect for small to medium-sized yards. It also has a single lever that can help you reach six different height levels so that you can cut anything from 1.18 inches high to 3.15 inches high. It comes with a full two-year warranty, which is there to provide peace of mind, should anything go wrong with the mower during normal use. It’s also ETL approved and Energy Star certified. 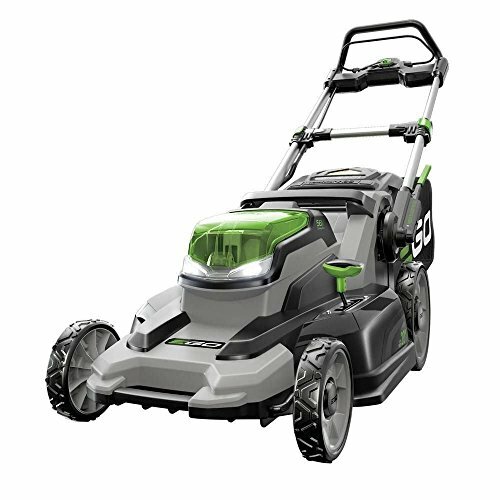 With this mower, you’ll be able to achieve up to 40 minutes of nearly silent runtime on a single charge. BLACK+DECKER CM2043C Cordless Mower, 20"
This Black and Decker mower has a 20-inch deck and folds easily so that you can store it upright in compact spaces. This is very convenient when you don’t have a lot of room to store a mower. It comes with two 40v Max Lithium-ion batteries which will keep you from having to wait for a single battery to recharge during longer jobs. All you’ll need to do is switch out the battery and place the old one on the charger. You’ll also get the option of bagging, side discharge or mulching your clippings. This mower will also allow you to be able to reach the grass and weeds that are along the edges of your yard and spend less time trimming due to its unique design. You’ll also be able to adjust the height at which you want to mow with a single handle. This mower will be capable of cutting grass and weeds that are between 1 ½ inches and 4 inches as needed without the use of tools. 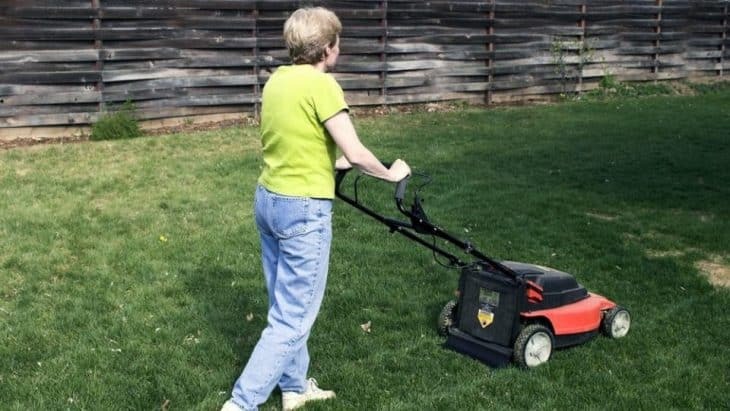 There’s a 3-year limited warranty on this model, which will allow you to get the help you need, should something go wrong with the mower during normal use. 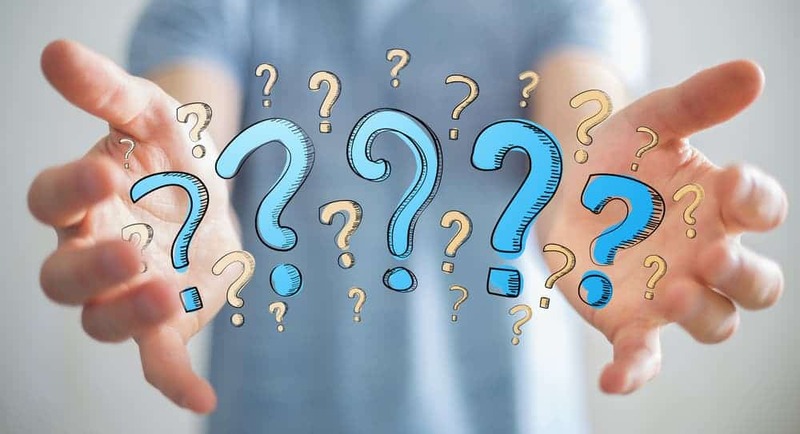 It’s always a good idea to make sure you know the ins and outs of the warranty, that way you’ll be prepared and know what it will cover and what it may not. When you only have a small yard to mow and don’t want to spend a lot of money on a lawn mower, then there are plenty of more budget friendly options available. These options do tend to be smaller, which makes them more convenient to store if you have limited space. They’re also easier to maneuver for those who struggle with arthritis or other physical complications that make using a heavier mower difficult. Some of these tools are small enough to be able to be used in different ways. For example, one mower on this list is able to function as a trimmer or edger as well as a mower with the addition or removal of convenient add-ons. This multiplies their usefulness, which means you not only get a mower at a lower cost, but other tools as well. For a lot of these mowers, you can still get a lot of value for the money. It’s just important to keep in mind that they may not be as effective if you have a larger yard that needs to be mowed. The best battery powered lawn mower for small yards will not be the best for large yards, obviously. Another thing to keep in mind, is that in some cases, the batteries on budget mowers may not last as long as more costly options. They also aren’t likely to have the same amount of power, which means they’re going to be better adapted to regular maintenance jobs where the grass hasn’t gotten too high. 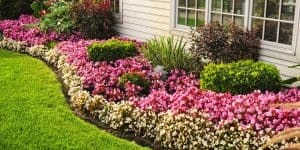 Too much overgrowth can cause them to struggle, so it may be wise to use a more powerful mower or hire a professional to bring the yard back to a well-trimmed state if the lawn has overgrown too much. This mower has a 28v lithium-ion battery that is capable of lasting up to 25 minutes on a charge, making it a great lawn mower for small yards. It also comes with a 10.6-gallon clipping bag to help you keep your lawn looking clean after you’ve mowed. The convenient push-button LED battery indicator will allow you to easily see how much battery life you have left at any given point during your work. There’s also a removable safety key that helps to prevent accidental starts, keeping you and anyone around you safe. This machine starts easily with the push of a button, meaning you won’t have to spend a lot of time pulling on a cord to try to get the motor going. It’s able to cut a 14-inch wide path, making it really nice for smaller areas and those that may be hard to reach with a larger mower. It also has a 3-position manual height control so that you can get the ideal cut for the length of your grass. This mower is ETL approved and comes with a full two-year warranty, meaning you’ll have peace of mind in knowing that the company will be there to help you if anything goes wrong. After all, great customer service and the willingness to stand behind a product is just as important as the quality of the product itself. 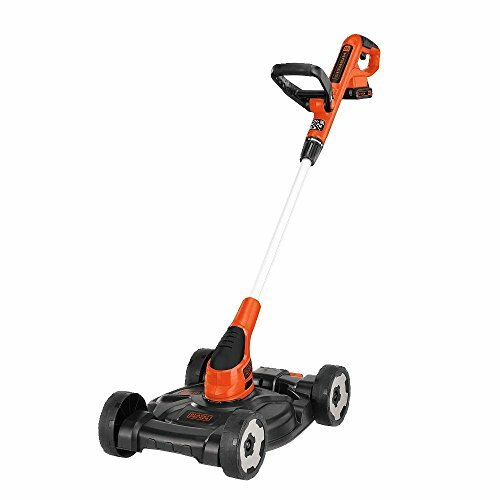 This Black and Decker mower runs on a 20v Max Lithium-ion battery, giving you freedom from having to drag around a cord or buy gasoline for refueling. All you’ll need to do is make sure you have a fully charged battery and you’re ready to work! This particular model also gives you three tool options in one, as it works as a mower, trimmer, and edger. That way, you get all the lawn work done with one simple device. You’ll also get the benefit of the automatic feed system which will make sure the machine keeps working without bumping or making you have to stop. This machine also has a Power Drive Transmission that keeps it from bogging down and an adjustable height deck so that you can get just the right cut for the length of your grass. The pivoting handle also makes the job easier and keeps you from having to strain yourself moving it around. 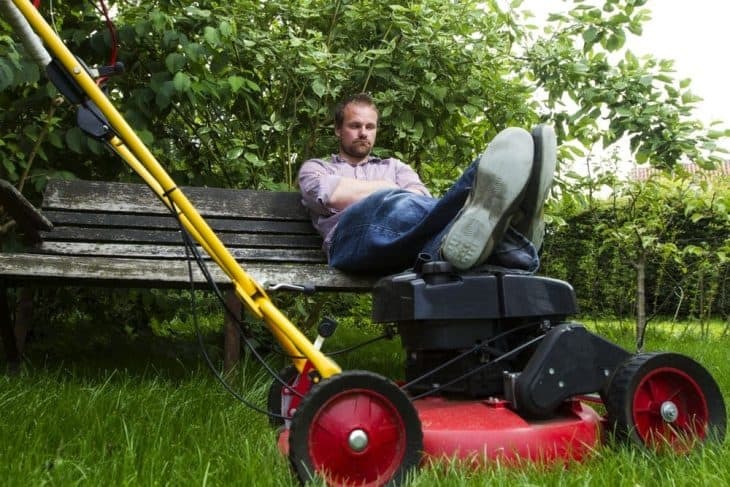 With this mower, you’ll get two batteries so that you don’t have to wait for the battery to recharge during jobs that might be a little longer. Overall, this little tool is great for smaller yards up to 1,200 square feet and yards with small inclines. Even hard to reach areas will be able to be trimmed down with this convenient device. 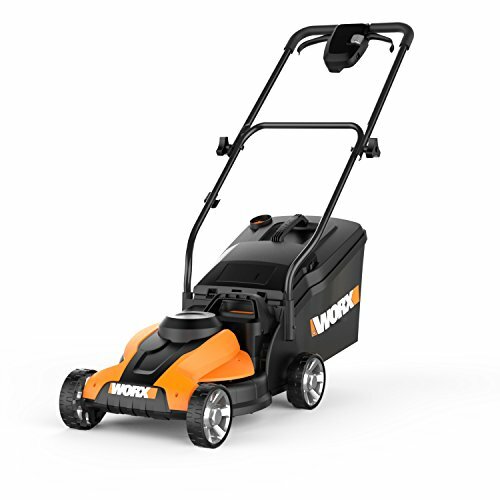 The WORX mower offers a 3-in-1 possibility for dealing with the clippings from your work. You can choose from bagging, mulching or rear discharge depending on your preference. This is a lightweight mower, coming in at a mere 33 lbs. That makes it very easy to push around and lift if needed. It also comes with a removable battery that will be able to be recharged and placed back on the mower when you need to use it again. It has an easy-to-use push button start, so you won’t have to worry about tugging on a cord to get going. This mower will be able to handle up to 6,000 square feet on a single charge. 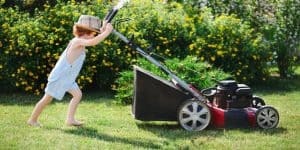 If you have a very small yard, then that may mean you can use it a few times before you need to charge the battery again. Otherwise you know it’s going to last for the long haul. It also has a battery level indicator that is going to be easy to read, which will let you know when the battery is beginning to reach a point where it could use another charge. This model is also designed with an ergonomic upswept handle, which is meant to reduce fatigue and allow you to get better control. The 14-inch deck will be able to help you get into hard to reach areas, or otherwise be the perfect size for a smaller yard. It’s a quiet machine that will be able to get the job done without waking up the neighbors or causing damage to your hearing, which is convenient when you prefer to get your tasks out of the way early. The small size also makes it very easy to store even when space is limited. 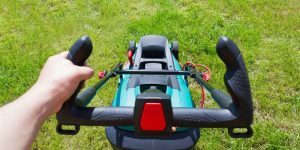 If you are looking for a quality lawn mower that is easy to use and isn’t going to cost a grand or more, any of these three cordless lawn mowers could be the right choice for you. They are all battery-powered, making them quieter and easier to use than gas and electric corded mowers, and all cost less than $500. This is not the only savings though. 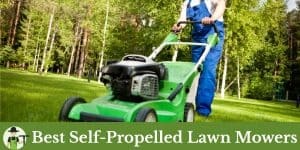 You also save money in the long run because you don’t have to buy gas and oil for your mower. While there are some customer complaints about battery life, you will find that there is not a product in the world that doesn’t have some customer complaints. You just need to take a look at both the positives and the negatives, and decide which is going to be the best lawn mower for your particular needs. If you have a small to mid-size yard, and a small to mid-size budget, the above lawn mowers are all excellent options for you to consider. Simply put, battery-powered self-propelled lawnmowers have become feasible. In the past, electric lawnmowers weren’t seen as ideal for making use of the self-propelled functions that are popular in certain mowers. The technology has improved, though, and you can definitely find a good electric option in this area. It may not be quite as powerful as some of the gas-powered models but it will run quietly and will work great for small residential properties. If you want to look into buying a self-propelled model, it’s important to consider whether you need it first. 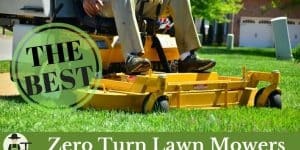 These models will be very easy to push and can make your task of mowing the lawn so much simpler. You’ll be able to breeze through cutting your lawn. These mowers will be fairly light as well so hauling them somewhere won’t be too difficult either. They can hold a charge for a long time so you won’t have to worry about stopping to put gas in your mower. If your yard has spots with hills or significant slanting, then you’ll really start to see the advantages of owning a self-propelled model. It makes going uphill much easier and will simplify your mowing experience. Battery-powered self-propelled mowers are definitely feasible and they can be of good use to you. 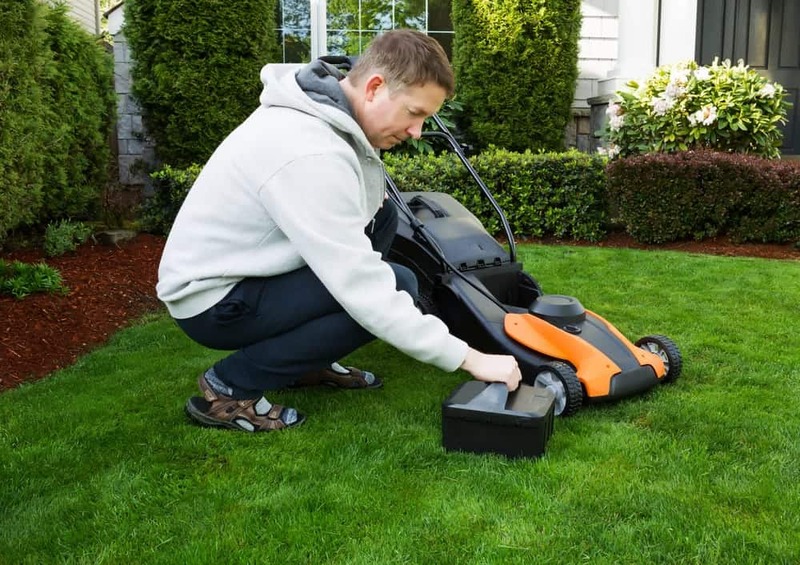 You may have need of a mulching battery lawnmower, depending on your situation. If you need a mower with more power than usual to get through your lawn mowing duties, then this is a good option. It has the power you need to handle tough tasks while still giving you the convenience that comes along with a battery-powered mower. 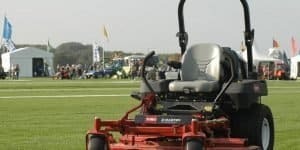 It’s much closer to the performance of gas-powered mowers without having the inherent flaws present with those types of mowers. 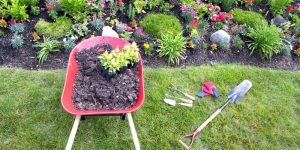 Mulching can be a good thing for your yard as well. It will simply come down to whether you have a large enough property to make good use of this type of mower. If you have a small little yard, then you may not see the full benefits of this sort of purchase. Anyone with a larger residential yard or who lives in a rural area would love to own a mulching battery lawnmower, though. Forget about it! Winterizing traditionally means draining the gas and replacing the engine oil on gas powered lawn mowers. However, with these battery operated lawn mowers this is a thing of the past, as there is no gas or other type of combustion engine involved. What I would recommend to do though, is to make sure you put the mower away clean for winter. Make sure all the grass clippings are washed of off the machine, especially under the mowing deck. If you don’t do this now, it will be much harder to do it in spring. Also, if you live in a cold climate with freezing temperatures during winter, it’s a good idea to not leave the batteries in a cold shed. Batteries do not like cold temperatures, and they will deteriorate quickly if you leave them in the cold and unused for several months. Take the batteries with you in the house. The machine will be fine in whatever temperature, as long as it’s stored in a dry place. There are many types of lawnmowers available for purchase; riding lawn mowers, robot mowers, corded, cordless, self-propelled, gas-powered, zero-turn, etc. However for most homeowners, a battery powered lawn mower will be the best choice. The higher end machines can cut 1/2 acre properties on one battery charge with ease, which should be ample capacity for most homeowners. And if you have a larger property, just get yourself a second battery, or mow the remaining part another day. Nowadays I think gas-powered mowers are really only necessary for lawn mowing business, where they need consistent power all day, every day. Riding lawn mowers I would only recommend to people who have multiple acres to mow. With the reviews on this page, you should be able to select the best battery powered lawn mower for your needs. For every budget, we have selected a winner. Obviously the high-budget mowers are of better quality, but not everybody needs to spend that much. Stay within your budget, think about the features that are most important to you, and you will be able to select a battery operated lawn mower that is perfect for you.